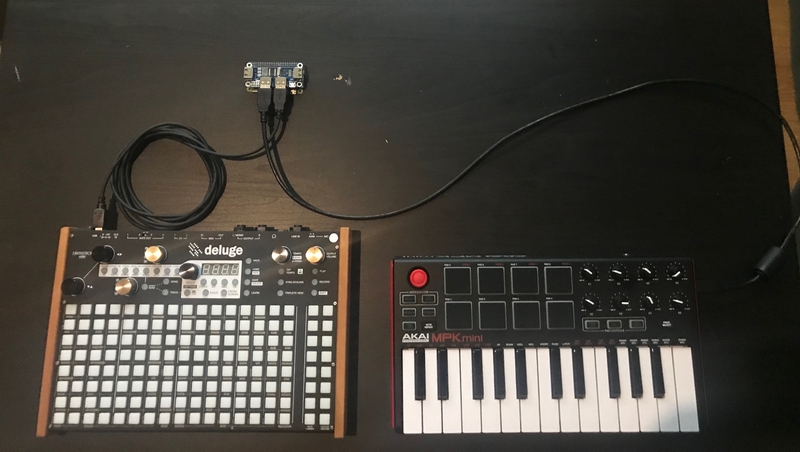 I like to share my almost finished project to have "usb only controllers" work directly with de Deluge (or any other usb midi device for that matter) the Idea was brought to my attention on the Deluge Facebook group by Fabio Barbon. The Zero is running vanilla raspbian jessie in read only, so you can pull the power and don't risk sd-card corruption. The Zero wakes up and automatically connects the midi devices. thats it! for maintenance, the Zero is configured to connect to my hotspot automatically, If it doesn't find my network, it will create a hotspot for you to connect to and that way you can ssh into it and configure what ever you like. this, off course, works with any raspberry. sIRwa2 this looks awesome. I assume you need to power the Raspberry via another usb lead and that provides the controller with juice? I've recently added instructions to connect a 128x64 1.3' OLED display (https://amazon.it/AZDelivery-Display-retroilluminato-Raspberry-gratuito/dp/B01L9GC470/ref=sr_1_2?ie=UTF8&qid=1550633976&sr=8-2&keywords=SSD1306) to the Raspberry for displaying active MIDI connected devices by name. This box works surprisingly well even with chained usb hubs. I am using this trick to control 6 synths with my deluge (3 raspberry usb ports, fourth is used to chain a 4 port standard usb hub). Thanks for that! Works very well for me too. This looks like an awesome way to chain lots of midi devices together. Does the Raspberry Pi basically act as a midi thru for all connected devices? For example, would all midi data received into the Raspberry Pi be sent to all devices that are connected? And what about if a Midi device that is connected gets its power from its usb port - does the raspberry pi draw enough power to power external hardware? ... would all midi data received into the Raspberry Pi be sent to all devices that are connected? You should have enough for a few simple devices. But the worst that could happen is the connected devices don't work reliably or don't power on. The best idea is to use a USB hub connected to the Pi - one that supports an additional separate power supply. Thanks for the information Tenebrous! I was plan to power a Novation Launch Control XL and an Arturia Keystep with the Raspberry Pi but like you said it's probably best to have a powered usb hub in case I need more power. I found that the Keystep draws 500mA according to the manual. Does anyone know how much the Launch Control XL draws? I couldn't find it anywhere in the manual.